With In The Woods festival fast approaching I thought it was about time I got packing, or at least thinking about it. After all the task of packing up the flat is a little more important. Still I found some time to layout some of the essentials to document them for this. In The Woods is a short weekend festival, we will be arriving on the Friday afternoon and gone again by Sunday afternoon. This means I don’t need to pack a huge amount of gear, however this is the first festival I am driving too and will not have to carry everything on my back. Cue packing overload… My packing list however is the basics and nothing else, lets hope I can stick to it! The main day of the festival is Saturday so I will be wearing my chosen outfit of the flowery dress and tights (because summer in the UK seems to have disappeared already!). The dress was a right bargain from Tesco and floral seems to be on trend at the moment. I plan to wear my back up outfit to the festival on Friday and possibly again on Sunday to leave in (if it’s still clean). 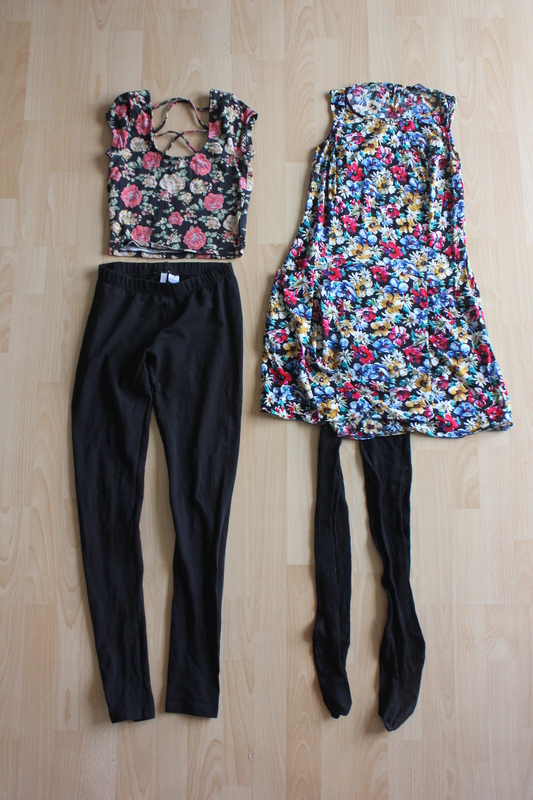 The floral crop top is from Forever 21 and the leggings are just an old pair from H & M.
NOT PICTURE: I have also found out a blue long cardigan as we all know it won’t be warm enough for short sleeves. I am however hoping to get my hands on the Crochet Kimono I featured in my Festival Wants post. I am taking a long sleeve top and trackies to sleep in, late August can get pretty chilling in the night so I want to be prepared. An extra jumper is always good and this one is even a little stylish – I am taking a huge risk by taking something white but I think I’ll appreciate how warm this top is more. Also pictured are some knee high socks which I will wear with the dress if it isn’t too chilly, if not then having a pair of big socks is always a great extra layer. NOT PICTURE: Extra hoody for sleeping in. I would normally take wellies to a festival but considering this is a much smaller affair than Reading, I don’t think it can get too muddy. I will instead be taking my brand new Dr Martens that I got off of my Festival Wants list. I will also pack flip flop because they always come in handy. I’m hoping to pack all of my stuff in to that back pack. It is my tried and tested daypack that I have been using since 2010! I am doing something I’ve never done before and am going to take a handbag, being such a small festival I’m hoping my things will be safe in a bag. 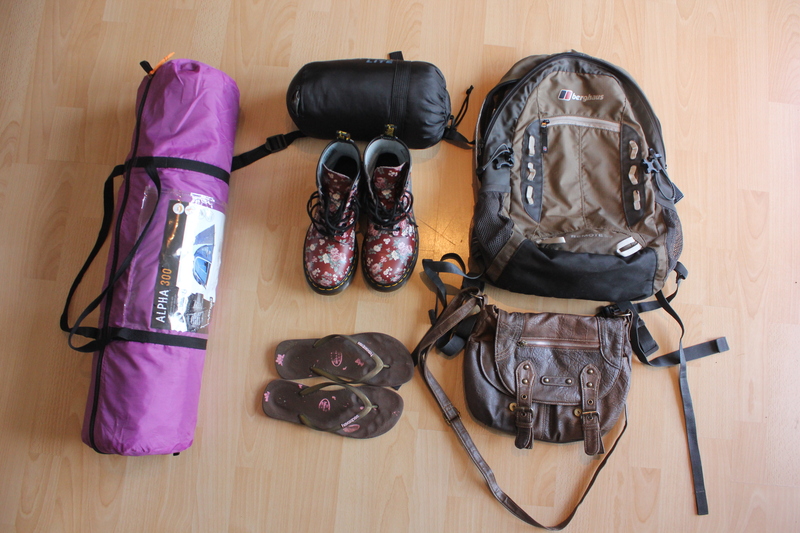 Last but not least I have my sleeping bag and tent – can’t camp without these essentials! Although I should probably check the tent as I don’t remember the last time I had it out. I will be taking my Go Pro to grab some footage on – the pole will certainly be useful in a crowd of people. I have opted to take a film camera with me, I love shooting on film and this fun fisheye should produce some fun photos. (MUST BUY FILM). I will of course take my iPhone but I don’t expect this to last all weekend so won’t be using it too much. 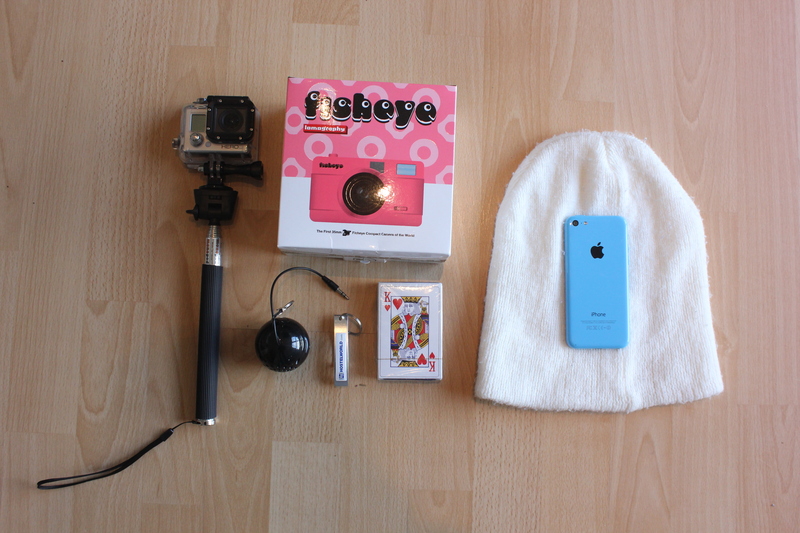 I’ve also added my speaker from Three to the pile, a pack of cards, wooly hat and bottle opener. On top of these things I will be taking toiletries: including essentials of dry shampoo and hand sanitiser. I’m hoping to get my hands on some neon paint for my face, if not I probably won’t bother with make up as I don’t normally wear any. I’d love to get a flower headband and some new sunnies too but it won’t be the end of the world if I don’t pick these up. I must remember to grab some cash out before hand as they don’t have a cash machine. I also need to plan food and drinks as I will need more cash if I am buying all my meals at the festival. I will certainly be stocking up on booze before hand as I can just keep it in the car. Lets hope this is everything, as I only have a very quick turn around from leaving our flat in Glasgow on Wednesday to arriving at the festival on Friday.